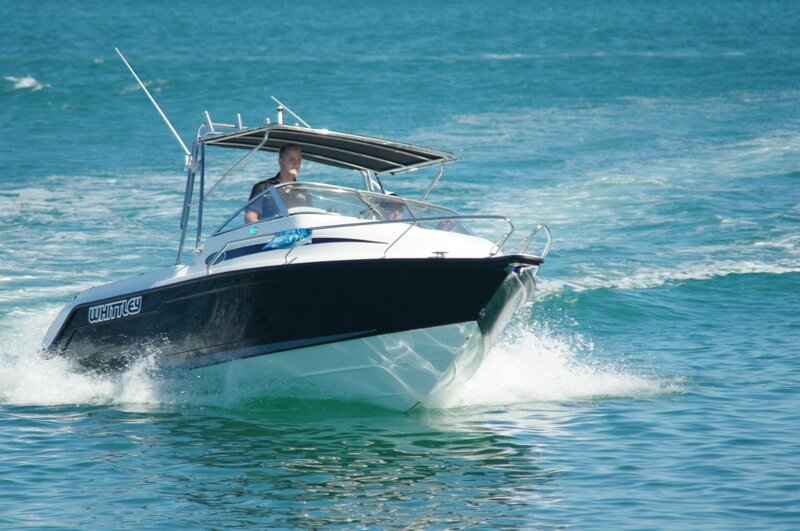 Whittley are probably best known for their excellent cruisers, but they also have a parallel line of boats for more active pursuits: the Sea Legends. Unlike many builders Whittley give them completely different hulls to similar length cruisers, featuring narrower beam and sharper deadrise – 23 degrees on the review 22 Sea legend. The thinking here is that that cruiser owners want volume in their hulls. And, because family cruising is practically synonymous with ease and comfort, those hulls are not going to be pushed hard in poor conditions. The hairier chested Sea Legends are better suited to the likes of fast runs out to the FADs, keeping the speed up in most seas. The 22 is well equipped for fishing. The fore cabin has been kept short, allowing maximum space to be devoted to the cockpit; seating is restricted to back to back seats. A wet locker is under the deck, a plumbed live bait tank aft near the deck wash; there is horizontal rod stowage within the bulwarks as well in the rocket launcher array, and thighs are pampered by padded coamings. The review boat was powered by a Volvo sterndrive and usually the inboard engine choice takes up valuable cockpit space, often making a big chunk of the transom unfishable. Here though, Whittley have made an extremely neat and small housing for the motor; plenty of room either side of it and no outboard making its presence felt. This is a practical boat but far from Spartan; the cabin in particular is well finished, with carpet and full lining. The bunks are really children’s length, but with the infill in place adult sleeping is possible. The infill would usually be left ashore, giving access to the chemical toilet. Ease of access marks another item in the cabin: a hinged panel with a single catch covers the rear of the steering gear, wiring and electronics. The deck around the helm area has carpet, held in place with press studs. The rest is naked, suiting most people although more carpet is optional. Above is a Bimini cantilevered forwards from its supporting gantry. Clears to fill the gap between it and the curved windscreen are standard. The seats are very comfortable, but standing is well catered for too. Slide the seats aft and take advantage of the full width grab rail atop the windscreen. Each back to back seat is mounted on a common storage box with enough room to house equipment as bulky as scuba gear. The seats face a thoughtfully laid out dash. Mounted high, needing the barest lowering of the eyes, are seven analogue gauges, leaving an area clear below to install fishing electronics. Other standard electronics are a 27-meg radio and Fusion stereo. The maximum permissible power for the 22 is 225hp, closely approached by our 200hp Volvo (that uses the same block as the pushrod V6 Commodore but with a half litre more capacity). The extra 25hp would be superfluous: performance is effortless and abundant, with the bonus of quietness. Power steering makes wheel turning effortless too. Naturally the sterndrive leg has power trim, but the Whittley also has trim tabs. There is little call for these to adjust fore and aft trim, but they come in useful with a fresh breeze on the beam. To hold a course in these conditions needs some wheel to windward which has the side effect of heeling the boat in the same direction. Hauling on some windward tab fixes this. The 22 Sea Legend is presented in a near complete package; all that is needed is a sounder – but these are a very personal choice – and a tank of fuel.